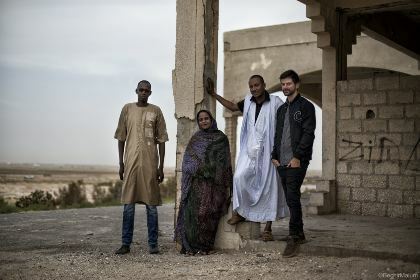 Noura Mint Seymali is a nationally-beloved star and one of Mauritania’s foremost musical emissaries. Born into a prominent musical family, Noura began her career at age 13 as a supporting vocalist with her step-mother, the legendary Dimi Mint Abba. Her grandmother trained her in the art of the ardin, a nine-stringed harp reserved only for women. Her composing instincts were encouraged by her father, an influential classical Arabic music scholar. Noura and her husband Jeich Ould Chighaly formed their first band in 2004. Jeich is a master of the tidinit (a.k.a. ngoni) and has translated the instrument’s intricate phrasing to an electric guitar modified with extra frets, spinning out fractal melodic responses to Noura’s authoritative singing, propelled by funk-savvy bass and drums, creating a compelling translation of time-honoured griot traditions to the contemporary moment.